Repair your iOS system issues at home. 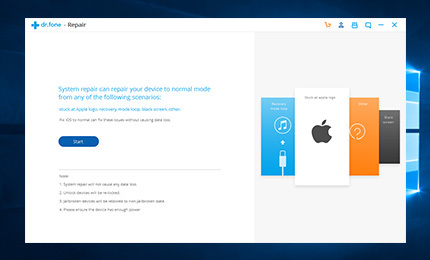 Connecting iOS devices to your PC and clicking for a few steps is the only thing you need to do for recovering the system and no data will be changed. All these operations can be easily done at home by yourself. No matter the iPhone or iPad is stuck in recovery mode or turns into black, red or blue screen. The iOS Repair program can help iOS system back to normal from frozen screen or crash. Instead of sending the broken iOS deviced to repair stores and spending a lot of money, this program allows you to fix your iOS system issues by yourself at home. Fix your iOS to normal from black screen, white screen of death, recovery mode and more. Unlike iTunes or iCoud restore, this iOS Repair software won't change any data on your device. When it gets back to normal, everything remains. No matter you're using the latest iPhone SE, iPad Pro, or the old iPhone 4, iPad 1, this iPhone data recovery is fully compatible with all models of iPhone, iPad and iPod touch. It won't steal, change or leak your data on the device, neither jailbreak your device. All it does is to get your broken device back to normal. This application is able to fix the iOS devices from black screen, white screen, restarting endlessly, recovery mode and so on. It takes only a few easy steps that everyone can use it at home. And no data will be deleted or changed at all with 100% security guarantee.